While not groundbreaking, I have sincerely been eating this on regular rotation in recent weeks and in the spirit of sharing the (carb)load, I thought this easy recipe was worth a bit of time in the blog limelight. When I was in kindergarten I had a Swedish Vietnamese friend who's mum made spaghetti with butter and yes, it is as delicious as it sounds. 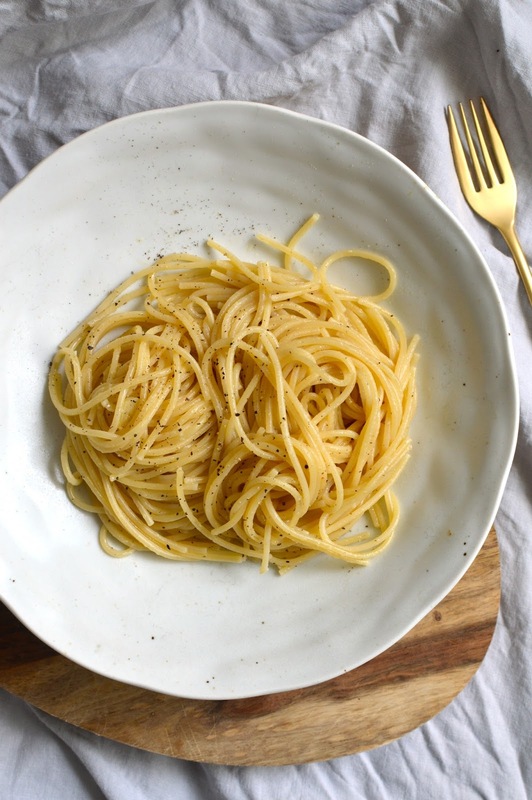 This version is slightly more sophisticated, but it's the addition of a splash of pasta water that gives it silky smooth, restaurant-quality appeal. Plus, cooking time is just however long you like to cook your pasta! Originally we were making this a few nights a ewek as we couldn't let Baki out of our sight for more than a few seconds for fear of a wee on the carpet or a dalliance on the sofa, and it was the easiest thing to whip up in a squeeze - plus, when your dog wakes you up at 5am, it's pretty hard to think of an exciting meal to make come 7pm. However, now we've found that he loves to watch us cook and will sit nicely for up to 40 minutes, willing any scraps to fall from the chopping board, so hopefully that means more recipes in Sprunting! 's future. Bring a pot of water to the boil with a big pinch of salt and add the spaghetti. Cook until al dente or to your liking - usually less than 10 minutes. Meanwhile, heat the olive oil in a frying pan on a very low heat and add the garlic. Stir occasionally and don't allow the garlic to burn, or it will get bitter. Just before draining the pasta, remove a small amount of the cooking water using a mug - about 50ml is enough for one person - and add this to the pan with the garlic. Drain the pasta, stir through the butter and add to the frying pan. The water should have mostly evaporated/soaked into the pasta. Serve immediately with a generous helping of sea salt and ground pepper - parmesan cheese is a nice addition, but I prefer mine without.